Over the last few weeks, Jordan Brand has been teasing three new silhouettes. While each silhouette has the same shape when it comes to the upper, they all have different midsoles. Two of those silhouettes are the Jordan Proto Max 720 and the Jordan Proto React. Based on the last word in each name, it should be pretty obvious what material is used on the midsole. The 720 features the Air Max 720 unit, while the Proto React uses, yup you guessed it, react technology. These silhouettes look pretty promising so far and Jordan Brand is taking advantage by showing off some pretty dope colorways. It's been said before but when a new shoe comes to the market, you can assume that a triple-white version will come out at some point. 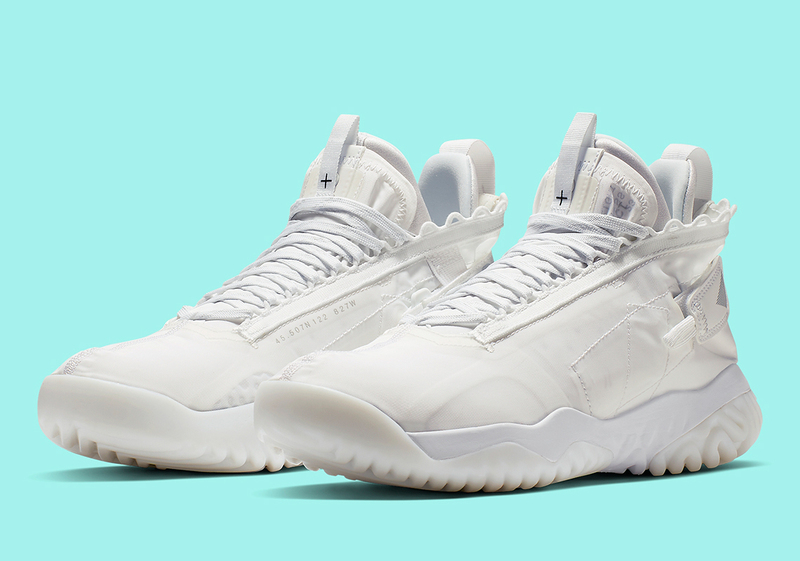 The Jordan Proto React is no exception to that rule as we now have some pretty fresh images of what the shoe will look like drenched in white. Considering the shoe is covered in white, it's a little hard to describe the shoe other than stating the obvious facts. Regardless, it's a clean take on a promising new model. According to Sneaker News, there is no release date just yet but expect it to drop in the near future for $150 USD.